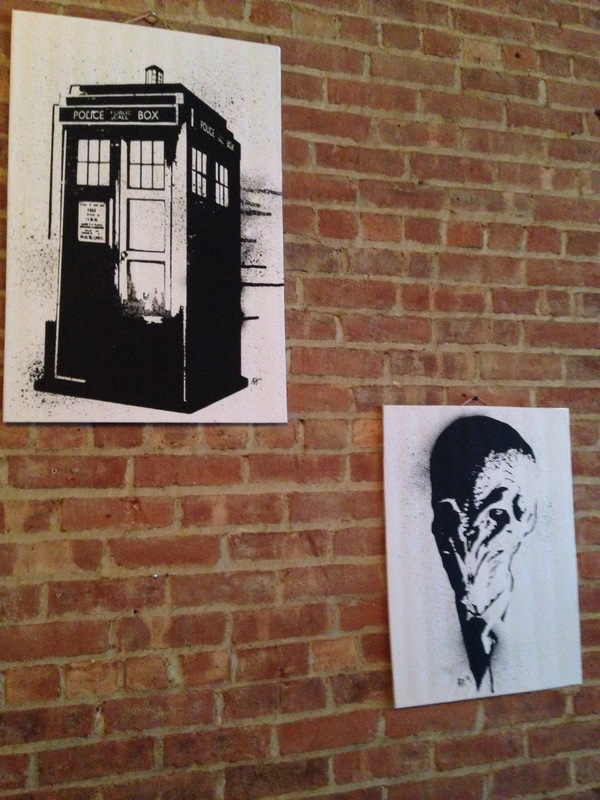 Many Whovian fans from across the globe have heard the news – a Doctor Who themed restaurant has opened up in Beacon, NY. 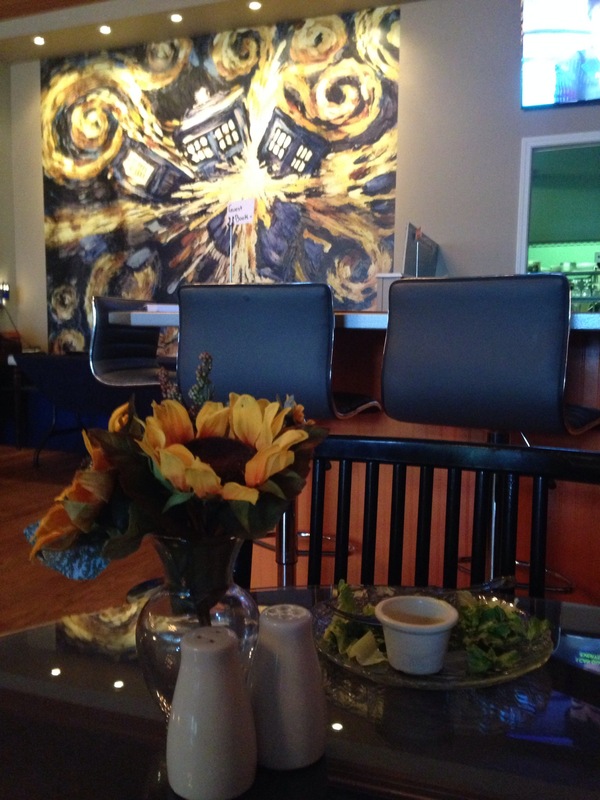 At only about an hour from Geekritique’s headquarters, my betrothed and I chose to finally visit the Pandorica. I had made a cursory visit a few days before my engagement, but didn’t have the time to stop in and grab a bite. My experience was rather pleasant, but not exactly perfect. 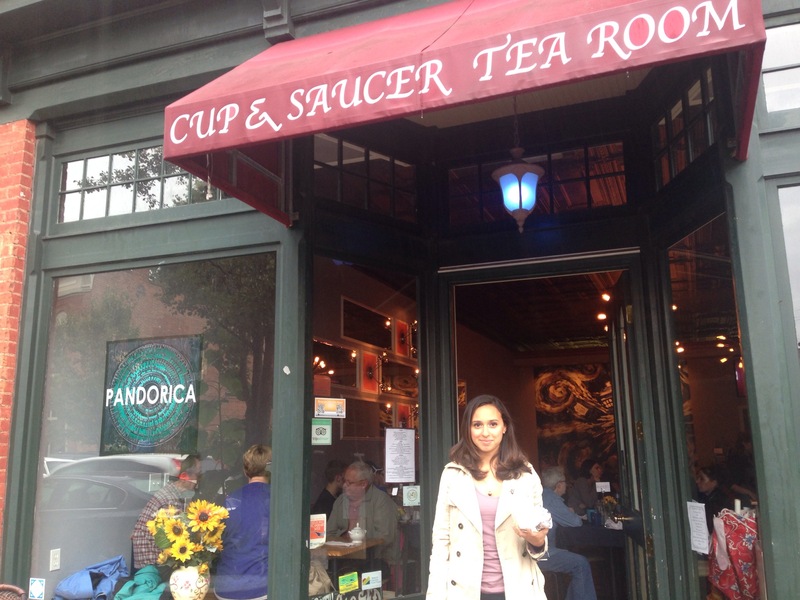 Originally called The Cup and Saucer Restaurant and Tea Room – it was nothing but that. Although it still bears that name on the storefront, the new management has different plans for the establishment. 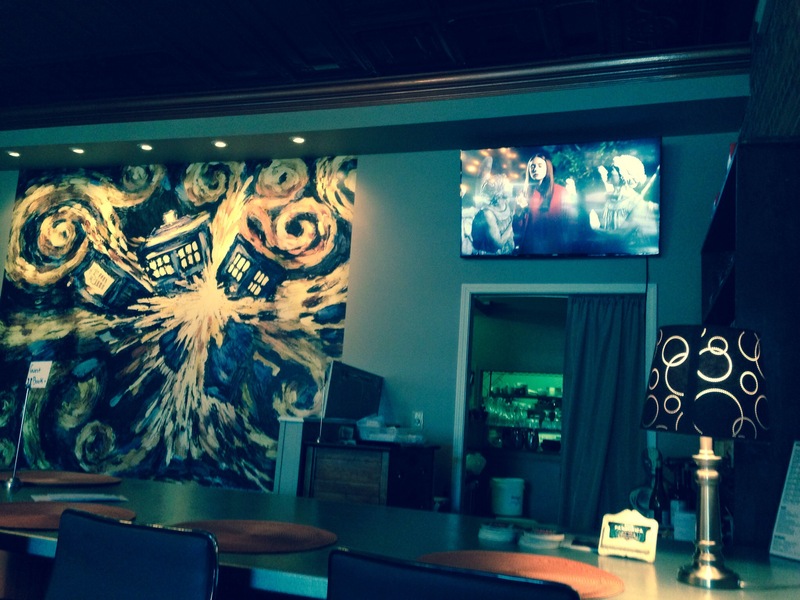 Entitled The Pandorica, it’s become a haven for Doctor Who fans of all backgrounds. 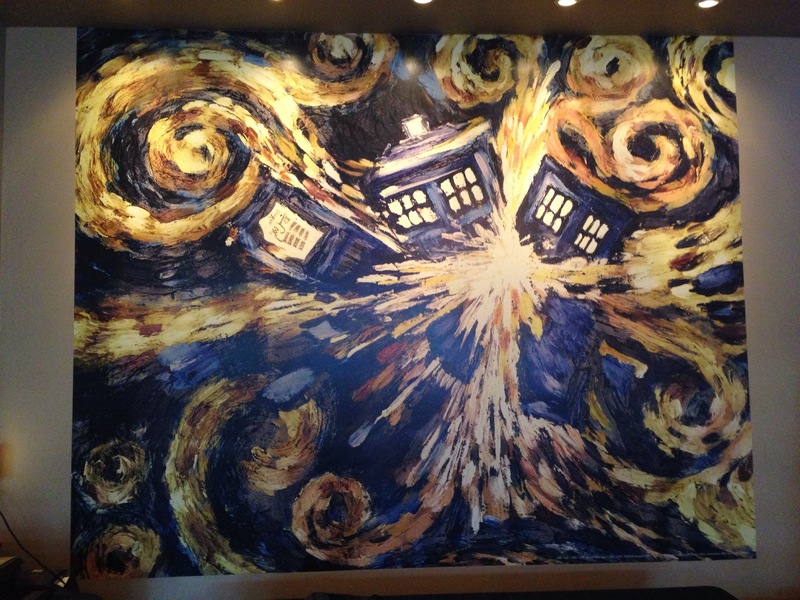 A large wallpaper of Vincent Van Gogh’s exploding TARDIS in the background, a TARDIS bathroom, a glowing crack in the wall, and the constant playback of fan-favorite episodes make this more of a club than a restaurant (in my opinion). Of course there is food to be had. Plenty of it. 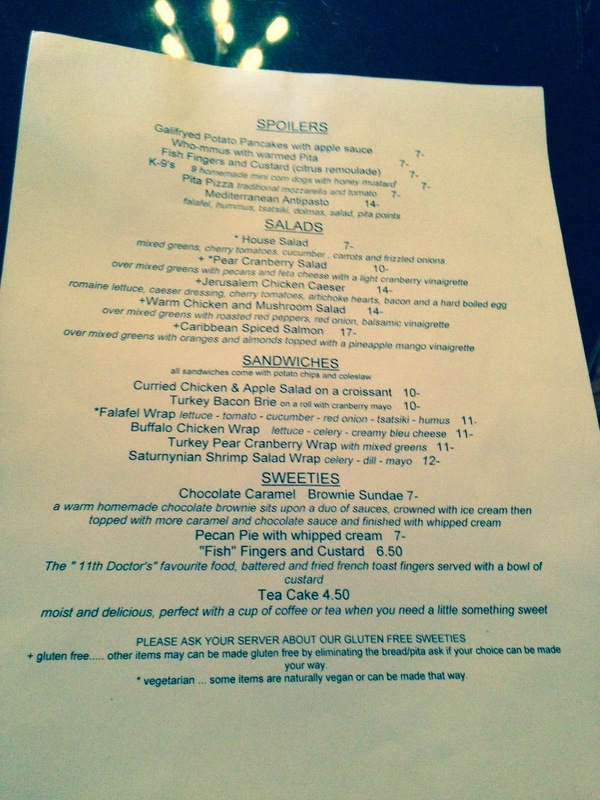 Their menu is also catered towards fans of the series (in some fashion or another). 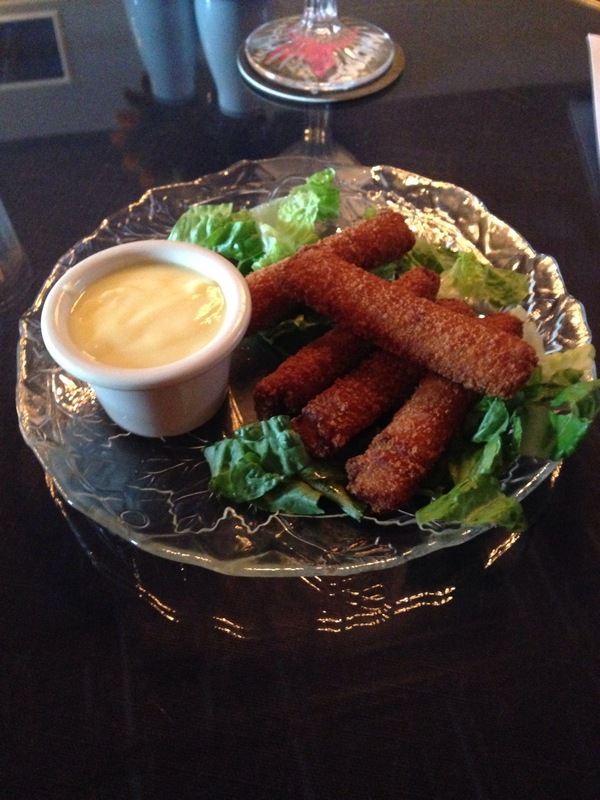 We had fish fingers in custard (which although it is on the menu we had to specially request real custard). To be honest that was the highlight of the food for me, despite the fact that it took some time before I actually understood the vastly contrasting tastes swimming within my mouth. The main course was nothing special. A sandwich with chips. There were a few options for different sandwiches, but nothing particularly spectacular. They serve it with chips (the American definition) and that’s it. We asked to switch it up with regular fries, but since that was considered “a side” they would’ve charged us an extra $4. Not a terrible up-charge, but really, all sandwiches I’ve ever had come with fries. If anything the alcohol was cheap. The service was great. We had a lovely waitress named Victoria that completely geeked out with us about (you guessed it) Doctor Who. The other staff was also equally charming. When we walked in, the tv was playing the tail-end of Flesh and Stone. Afterwards I requested to watch Midnight and they totally consented – the other guests were equally excited to watch the episode, which was a gratifying experience. My girlfriend noticed the table settings were (fake) sunflowers, which went along with the Vincent and the Doctor feel. Although we watched School Reunion afterwards, I got the vibe they don’t ever play any Classic Who. 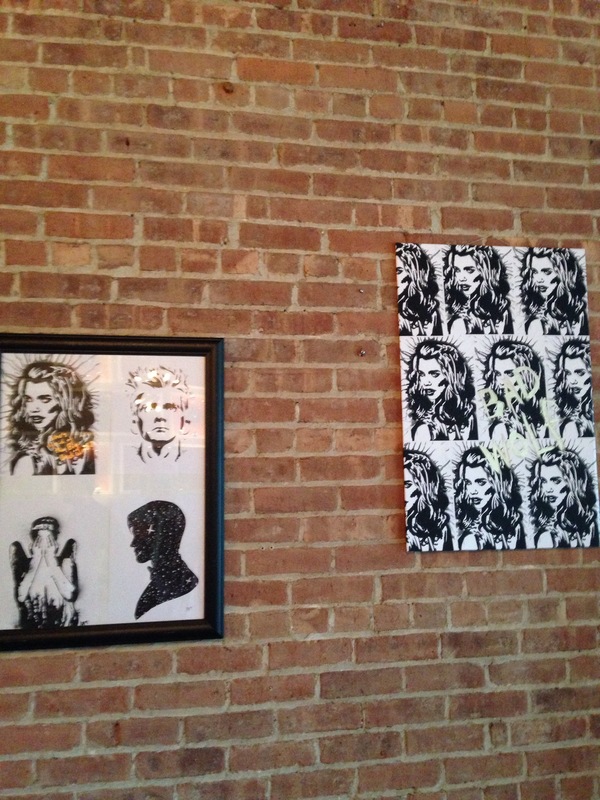 I was VERY happy to find out that a good personal friend of mine’s artwork was showcased. It seriously added to the appeal and atmosphere of the restaurant, because without it the place would’ve had far too much open wall space. 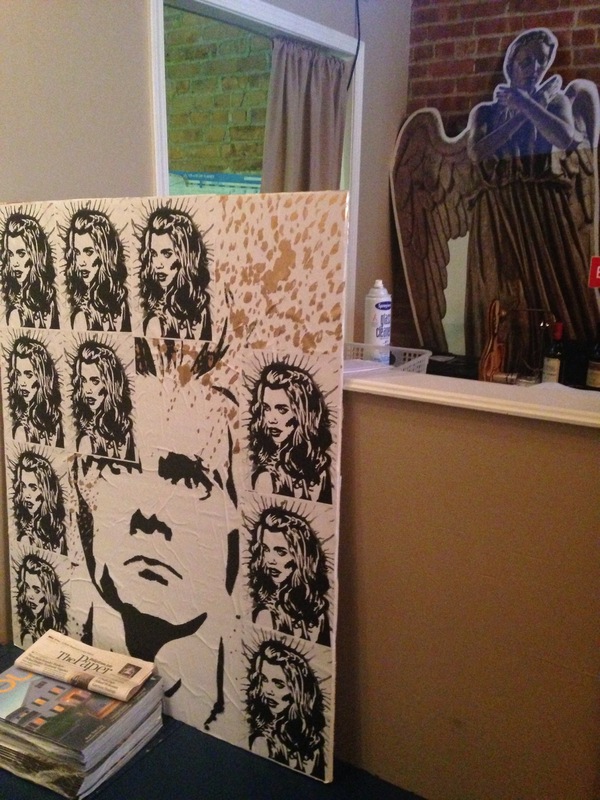 Visit her site at Bristles & Brushes for more artwork! 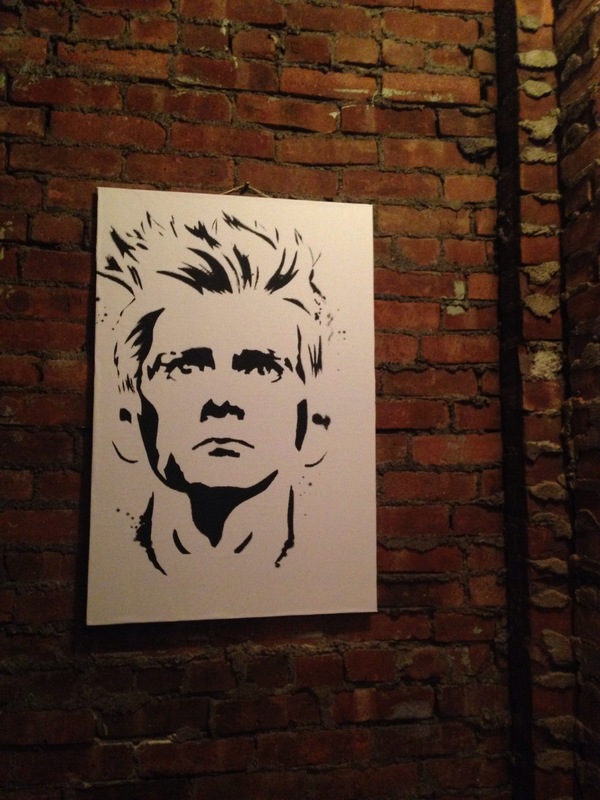 Although this locale needs a lot of work to become the viable restaurant it deserves to be, it was a fun excursion – and in good fun-loving Whovian company. Every week they stream the new episodes, and there is plenty to look forward to. Hopefully with continued fan effort it can grow into something truly amazing. I heard about this place from my girlfriend who found it somewhere online. This review only makes me want to go more! I loved the pictures you posted of it. I can’t wait to make a trip to New York and go there. Definitely a good time. Hope you make it! Fabulous post for any whovian. I’ve been curious about it ever since I heard about it. Thank you for making the trip since it is far away for me. I appreciate being able to live vicariously through you. Hahaha! Aww well hopefully you’ll be up here at some point to check it out yourself. I am so, so jealous. I really need to go to New York and visit it. 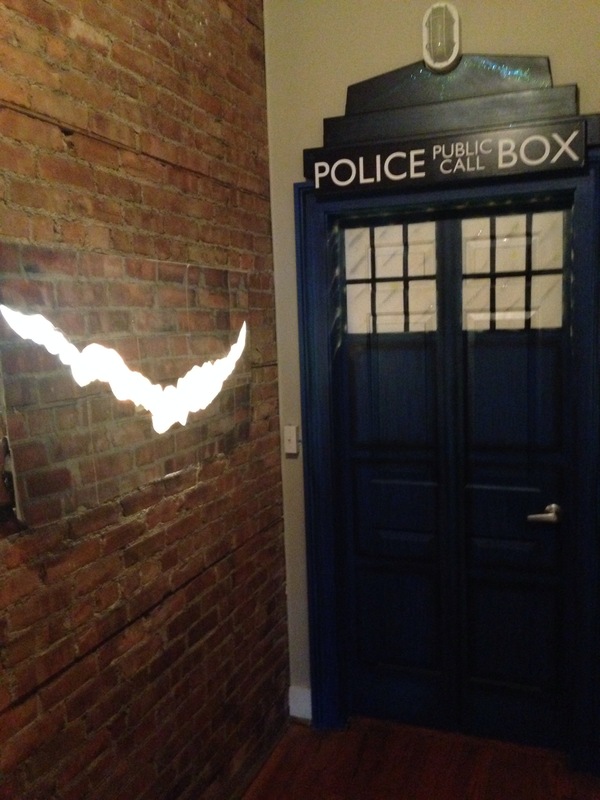 I notice the former sign is still there, and much larger than the Pandorica sign. Could this confuse any Not We who are visiting the restaurant? I’m sure it does. But it’s hard not to get the memo upon entering due to the heavy theme. A nice idea but it looks like it needs a bit more work yet. If it becomes a success these chaps ought to open up an English style Tea room serving High (Gallifreyan?) Tea for the Classic Who fans perhaps based on The Scope or Space Museum? Staff naturally should be encouraged to wear approximations of some classic era outfits. I like the idea about the outfits. It’ll get dicey when one shows up in Adric’s tunic though. Please excuse me while I freak out and jump on the next plane to New York. Lol, hey no worries. Good review. I have wanted to visit this place. 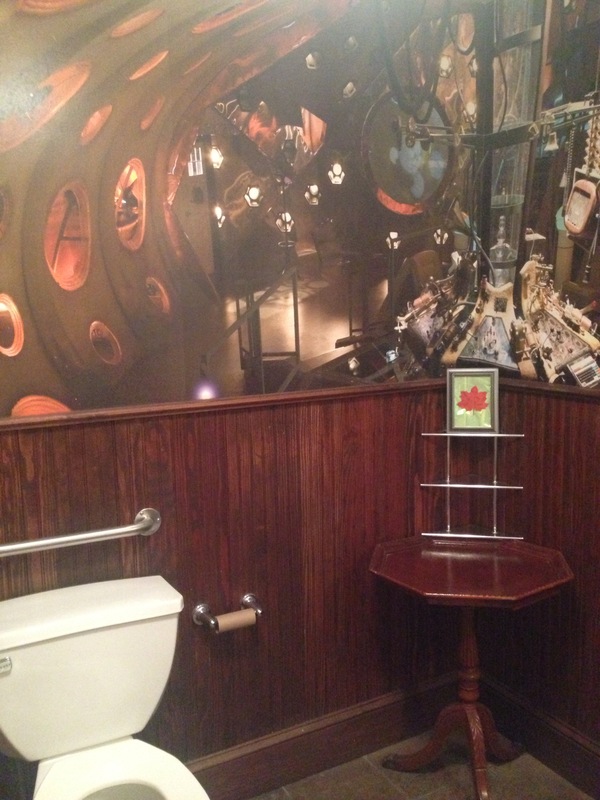 My only concern is the pic of the restroom…why is there to toilet paper on the roll? :O Other than that it sounds like a great spot with loads of future potential, especially with how they have named the categories of the menu.